Blackberry Gemini service will be marketed four partners Research in Motion (RIM) the end of this September 2009. What are the features offered by mobile phone has the original name of this BlackBerry Curve 8520 Gemini ? Gemini is the first BlackBerry that uses soft trackpad as navigation buttons to access music, video, games, email, messaging, and social networking sites. For typing, the phone is still using full-QWERTY keyboard. In addition to the standard features of the BlackBerry Internet Service (BIS) to access email accounts and 10 is also the BlackBerry Enterprise Server (BES) for security features and enterprise administration, BlackBerry Curve 8520 also offers new features for multimedia. "We are also adding features that the BlackBerry Media Sync will make users more easily synchronize music from iTunes or Windows Media Player with Gemini's smartphone users," said Gregory Wade, RIM's Regional Vice President in his explanation, Thursday, September 24. To support multimedia functions, RIM buried 2 MP digital camera with zoom function and video recording. In the system of operation is also provided the latest media player for music, pictures, and videos with special media keys and a 3.5mm stereo headset jack. He also mentioned that the phones that use flash memory and 256 MB 512 MHz processor newest generation, it offers premium features such as voice activated dialing and Bluetooth 2.0 support for hands-free use with headsets, car kits, stereo headsets and other Bluetooth accessories. Although you have prepared the 2 GB memory card in the BlackBerry Curve 8520, Gemini memory can also be added by using a memory card slot hot swapable microSD / SDHC capacity to 32 GB. Problem speed access, this phone is believed to still have a high speed though does not have 3G/HSDPA connection. 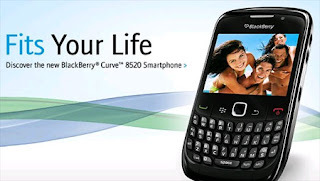 BlackBerry Curve 8520 operates in a network EGDE / GPRS / GSM (850/900/1800/1900 MHz). For alternative connections, RIM also provides built-in WiFi on the Gemini. No official statement announced four operators RIM partners about bundling the sale price of this device. However, one of the top brass that the operator ensure the selling price will not exceed Rp 3.5 million.